The earliest datable Indian painting is a group of Buddhist frescoes (100 B.C) (Fresco painting is done upon freshly laid plater before it dries.) In 1819, Europeans stumbled upon the ruins of the old temples and were amazed to find on the walls frescoes that are now ranked among the masterpieces of the world's art. The temples have been called caves for, in most cases, they were cut into the mountains. One cannot but admire the nobility of the subject, the majestic scope of the plan, the unity of the composition, the simplicity and decisiveness of the line in these paintings, particularly, the perfection of the hands. At Ajanta, religious devotion fused architecture, sculpture and painting into a happy unity and produced one of the sovereign monuments of Hindu art. When their temples were closed or destroyed by the Huns and Moslems, the Hindus turned their pictorial skill to a recording of the episodes of the Mahabharata and the Ramayana in delicate miniatures. Hindu paintings were rarely drawn from models; the artist visualized them out of imagination and memory. The constants in Indian art were reaffirmed for all time: its sensualism that in instances slips into direct eroticism, and its dynamism, a sense of movement and rhythm in the portrayal of the gods or of the swarming multitudes that cover the surface of temples. The great Bodhisattvas in the Ajanta Caves show the fulness of the Gupta style. The Gupta style is a combination of the Greco-Buddhist style with the native style of Mathura. The figure of Buddha is majestic and exceedingly refined. With a fluidity of line and a subtleness of coloration, they are expressive of the highest ideals of Buddhism, The Bodhisattvas are images of serenity thought patient meditation and sacrifice art of compassion for suffering humanity. The caves at Ajanta, besides being the hiding place of the greatest of Buddhist paintings, rank with Karl as an example of composite art, half-architecture and half-sculpture, which characterizes the temples of India. "Caves I and II have spacious assembly halls with ceilings cut and painted in sober yet elegant designs and are helped up by powerful fluted pillars square at the base, round at the top, ornamental with flowery bands, and crowned with majestic capitals. Cave XIX is distinguished by a facade richly decorated with adipose statuary and complex bas-reliefs. In Cave XXVI, gigantic columns rise to a frieze crowded with figures which only the greatest religious and artistic zeal could have carved in such detail. Ajanta can hardly be refused the title of one of the major works in the history of art." Three elements composed the structural plan of the southern temples: the gateway, the pillared pouch, and the tower (Vimana), which contained the main assembly hail or cell. Of the many buildings raised by the Chalukyan kings and their people, nothing remains but temples - which gigantic masses of stone are carved with the delicacy of lace and the artistic combination of horizontal with vertical lines, and the play of outline of light and shade, far surpass anything in Gothic art. If we marvel at the laborious piety that could came eighteen hundred feet of frieze in the Halebid temple, and could portray in them two thousand elephants each different from all the rest, what shall we say of the patience and courage that could undertake to cut a complete temple out of solid rock? But this was a common achievement of the Hindu artisans - carving several rathas or pagodas: cutting a hundred feet down into the stone to isolate the block - 250 by 160 feet to make the temple; carving a series of chapels and monasteries deep into the rock on three sides of the quarry. Every student of Indian art knows the tomb built by Shah Jahan, the captive emperor, built for his beloved wife, Mumtaz Mahal. 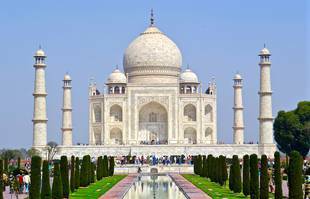 The Taj Mahal was completely Mohammedan. For twenty-two years, twenty-two thousand workmen were forced to labor on it. Although the Maharajah of Jaipur sent the marble as a gift to Shah Jahan, the building and its surrounding cost $230,000,000. The Taj Mahal is considered as the most beautiful of all edifices, framed on either side by handcome mosques and stately minarets. In the foreground, spacious gardens enclose a pool. Every portion is of white marble, precious metals or costly stones. The main entrance, once guarded with solid silver gates, is a maze of marble embroidery; inlaid in the wall in jeweled script from the Koran, one of which invites the "pure in heart" to enter "the Gardens of Paradise." The tomb had superabundant jewels, a golden railing encausted with precious stones. The railing was replaced with an octagonal screen of beauty, pleasing in its perfection. In our time, we can say that the old civilization of Indian is finished. It began to dies when the British came.